Please note: Papa’s Attic has moved! We’re now located at 213 South Main in downtown Ottawa, Kansas. Our new location is beautiful, offering even more space so we can fill our store with even more of what you love. We hope you’ll come in soon! 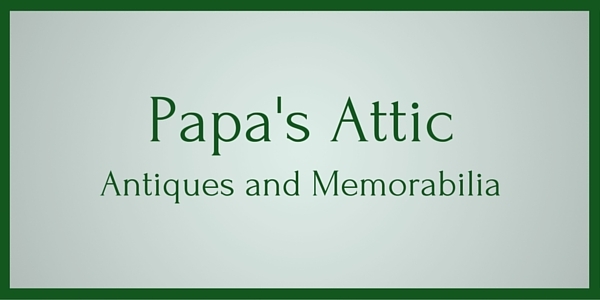 Papa’s Attic, LLC opened in August 2014 in historic downtown Ottawa, Kansas! Ever since, Papa’s Attic has been making sure there’s something for everyone, every time you drop by. A long-time educator and resident of Ottawa, Mark Cation (Papa) has been collecting a variety of antique items for more than half a century. Along with his wife, Debbie, this staple in Ottawa’s downtown offers plenty of unique items for the history buff inside each and every one of us. Enjoy the store and the conversation that will surely accompany your visit. Above all else, we hope you find something that speaks to you that you can enjoy for a long, long time.